Besides the curlicue mustaches, brightly hued turbans and heavy silver ornaments, Rajasthan is majorly about the massive forts and palaces. What makes Rajasthan stand out is its architecture that depicts royalty and sheer simplicity, all at once. These ruins have delicate carving which are boastful of the intellect and labor it took for its creation. Adding a bit more charisma to the whole setup of the state are its hill-forts. Though Rajasthan is a really hot state during summers, but the hillocks of Aravali ranges caress the state with pleasing breeze. The forts standing tall and wide in the ridges steals the spotlight. These forts were mainly made in the hill-tops for safety concerns, but this was not all it is confined to; they offered a lot more than mere defense. Listed below are the magnificent ruins of Rajasthan atop the hills, many of which are recognized by UNESCO as World Heritage Site. Not just a UNESCO World heritage side but rather a dreamy architecture sprawled on the area of 691.9 acres, perched atop at the height of 590.6 meters. What else you need to explain GRAND; we have all of that too! 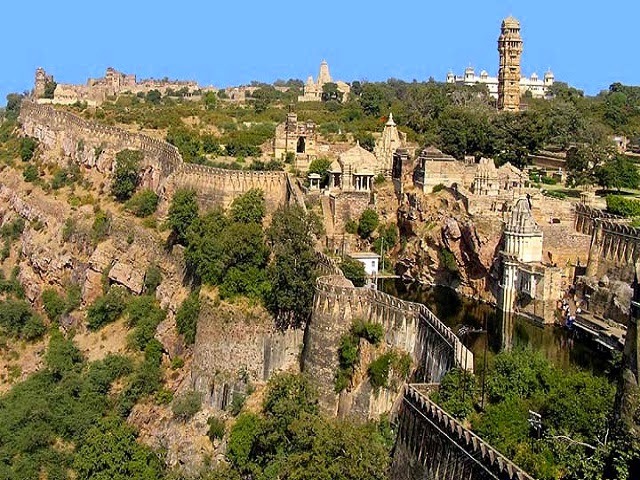 The Chittorgarh Fort is indeed the largest fort in India, it is so big that villages with more than 4000 people inhabit this fort and still covers a small part of it. The Chittorgarh fort has temples, palaces, awe-inspiringly grand gates and two iconic pillars. Some of the eminent rulers like Guhilat, Suryavanshi, Khiljis, Bahadur shah, Akbar and many others have cherished the beauty of this palace over the years; which being said makes it obvious that this fort has witnessed many battles and not just love from these rulers. Today, it only receives love, myriad of love from travelers around the world and off course its inhabitants! Kumbhalgarh fort was built in 15th century by Raja Kumbha and is situated amid thick forests and across seven grand gateways. 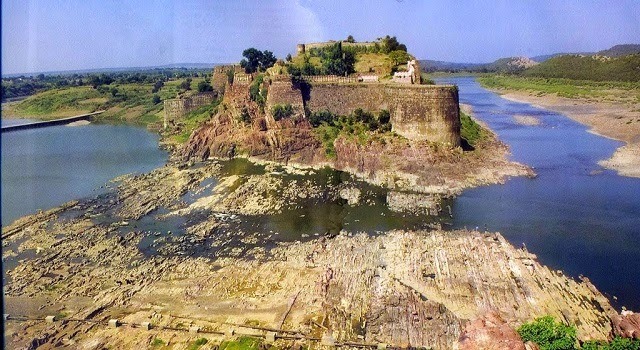 This fort was the second-most important fort for the Mewars, the famous erstwhile rulers. Today, the wall encompassing the fort is known to be the second -longest wall after The Great Wall of China. The Shiva temple out of 359 other temples in the fort and Badal Mahal are the most visited and adored spots of the fort. Badal Mahal is believed to be the birth place of the famous ruler Maharana Pratap and as the name says, this palace will make you feel like you are strolling in the clouds (Perhaps because of its blue-tinged color scheme). Ranthambore fort reflects the entity of Chauhans in the history and is famed around the world for its National park and Tiger reserve, which alone is spread in an area of 400 sq Km. This national park was a hunting paradise for the Maharajas back then. The fort is perched at the height of 400 meters and the inscriptions in the fort also reflect signature style of Nagil Jat clan, a small clan which existed during the Ashokan era. The Jogi Mahal in the fort is a guest house for eminent personalities and was also visited by the former president Rajiv Gandhi and his family. Situated in the summit; surrounded by the meeting point of two rivers (Kali Sindh and Ahu) and forest on its back side, it is pretty obvious that Gagron was designed to be unassailable. Inside the fort there is a temple dedicated to Shiva, Durga and Ganesha and outside is a Dargah of Sufi Saint Mitteshah which is bustled specially during Moharram. Also, the monastery of Saint Pipa nearby is a major attraction for the tourist other than this enchantingly rugged panorama. 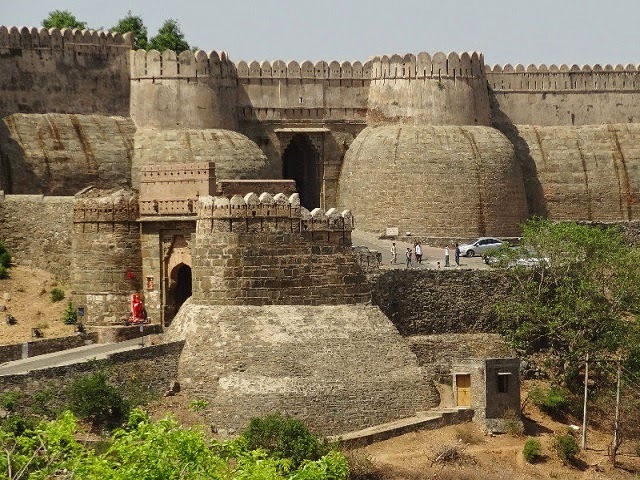 The fort was built between 7th to 14th century and during different periods it settled to be in control under Sultas, Rajputs, Khaljis, Mughal and many others legendary rulers. The Amber fort is located just 11km away from Jaipur. It is situated on the hill-top of Aravali ranges, adjacent to Jaigarh fort and receives more than 5000 visitors per day. 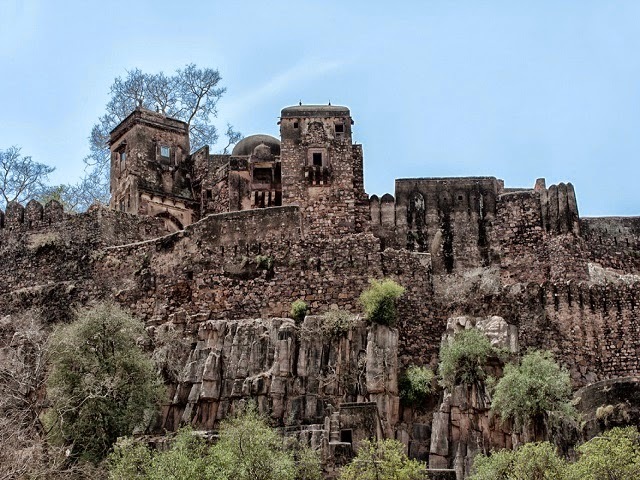 These two forts (Amber and Jaigarh) are rather considered to be a part of a single complex. Talking about Amber fort; the fort has a lake on its front side and then the staircases takes you above, to the fort. This brilliantly designed fortress is believed to be built during 1592 by Raja Man Singh and later Sawai Jai Singh renovated it. The fort is made of red-stone and marbles and has series of gates complementing its massive size. Just near Ganesh’s gate is a temple of Sila Devi, a goddess worshipped by the Chaintanyas. Built in the 1156 AD by Rawal Jaiswal, Jaisalmer Fort had also been under Alau-din-Khilji and Humayun after winning legendary battles. 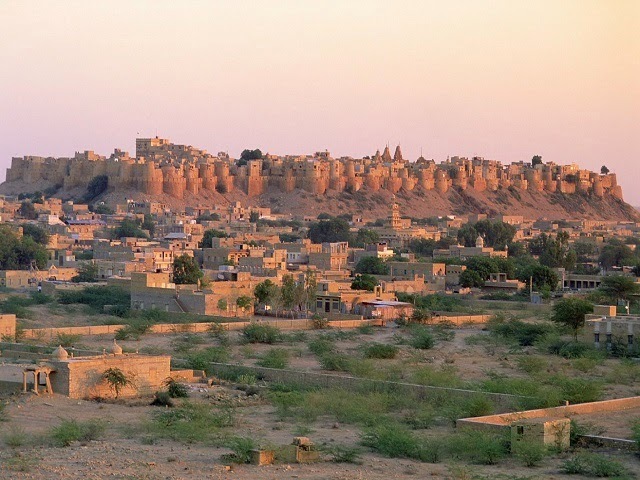 Jaisalmer fort is located in Jaisalmer amid sprawling Thar Desert. The Golden color of the fort makes it to be also known as “Sonar Quila” (Golden Fort). The fort, during the sunset camouflages with the sand due to their color. Jaisalmer fort has a Raj Mahal, havelis and a temple dedicated to Laxminath; and these happen to be the most visited sights of the Jaisalmer Fort. The World Monument Fund collaborated with India National Trust for Art and Culture (INTAC) to re-build and fix many areas of the fort, which collapsed or got ruptured due to seepage and other problems. The Queen’s palace now stands with pride and King’s Palace serves as the museum. The fort has undergone many such renovations and is conserved in order to make sure that it stays intact and lives even a longer life without its charm being faded. 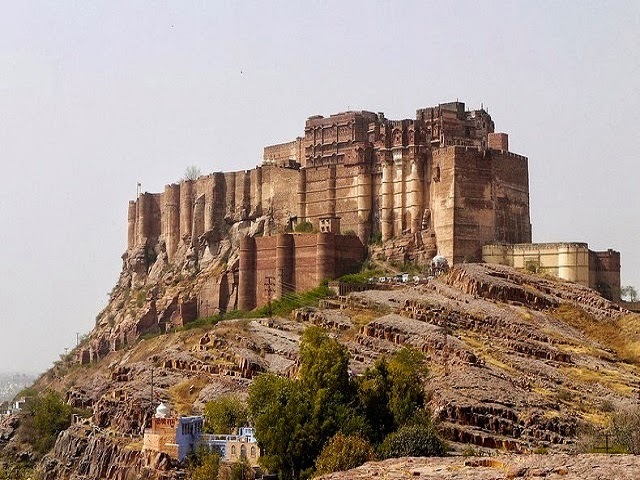 Located 400 feet above the city; Mehrangarh fort stands proudly like a confident artist does in the stage. The fort belonged to Maharaja Gaj Singh and is protected by imposing wall which well snakes around palace. The walls were obviously built to protect the fort and its inhabitants, but add a different spark in its overall appearance. There are imprints of cannonballs in the walls which speak about the intensity of the battles fought during that time. The fort has some really beautiful palaces adorned with finely-detailed carvings; chiseled with intensive dedication which is evident in its first glimpse. There are seven gates in the fort, of which Jayapol and Fatehpol are the most known. 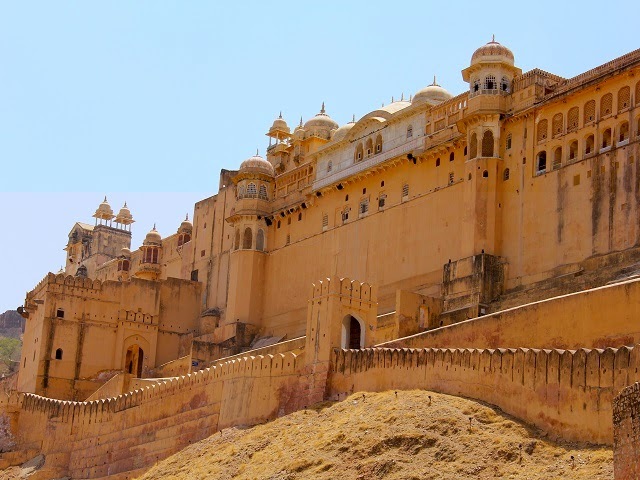 Mehrangarh is even buzzier during the Rajasthan International Folk Festival held in October or November. Just adjacent to the Amber Fort, Jaigarh was designed in order to protect Amber Fort; both are indeed recognized to be a similar complex. Both the forts are joined by subterranean passage and there is enough greenery to create a perfect panorama. 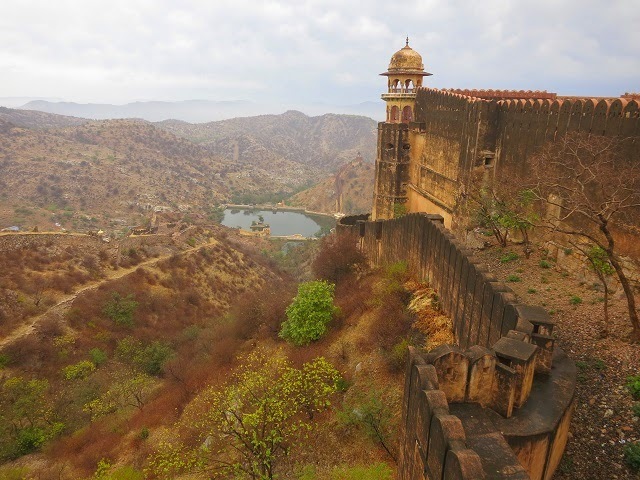 The fort is situated atop “Cheel ka Teela”, a hill in the Aravali hill ranges. There are well preserved gardens, some temples dedicated to different gods, a museum and palaces, inside the fort; and these well interprets the royal life of the kings and queens of that era.